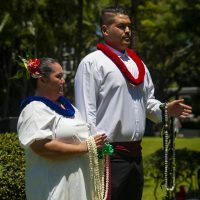 Under bright sunshine and blue skies the He Hali‘a Aloha No Lili‘uokalani Festival, Queen’s Birthday festival was held Saturday, September 8, 2018, at Lili‘uokalani Gardens in Hilo. The event featured music, dance, singing, ukulele playing, taiko drumming, and other featured performers. Food, cultural exhibits, crafts, massage, and activities for keiki were available. The event was hosted by the Friends of Lili‘uokalani Gardens.